The CDC Nimrod Loop Wing is a top of the water pattern. 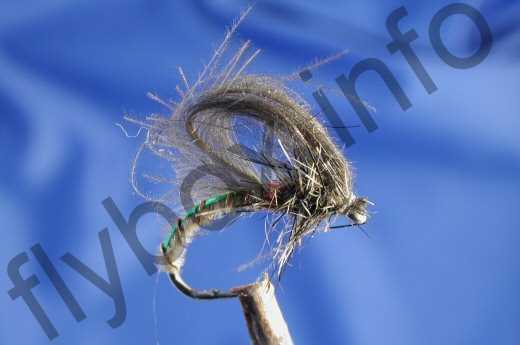 It has a cul-de-canard loop wing and is an excellent emerger dry fly. When trout are proving difficult, particularly in flat, calm conditions, try pulling the fly for two to three feet so that it submerges and then allow it to rise to the surface like the natural. Hook : Ashima F52 sizes 10-14. Body : Bleached pheasant tail. Rib : Fine copper wire over fine green tinsel that runs along the spine. Wing : Cul-de-canard loop . Wing case : Claret pheasant tail. Thorax : Fox squirrel, sometimes mixed with hare’s ear to give a buggy effect. Currently there are no comments about the CDC Nimrod Loop Wing fly pattern from other fly fishermen yet.